Tulsi has Power to heal: The tulsi plant has many medicinal properties. The leaves are a nerve tonic and sharpen memory. They promote the removal of the catarrhal matter and phlegm from the bronchial tube along with the mucus in the respiratory passages. The leaves strengthen the stomach. The seed of the plant are mucilaginous. Tulsi is useful in Fever & common cold: The leaves of tulsi are specific in many fevers. During the rainy season, when malaria and dengue fever are widely prevalent, tender leaves, boiled with tea, act as preventive against these fevers. In case of acute fevers, a decoction of the leaves boiled with powdered cardamom in half a liter of water and consumed with sugar and milk which brings down the temperature. The juice of tulsi leaves can be used to bring down fever. Extract of tulsi leaves in fresh water should be given every 2 to 3 hours. In children, it is every effective in bringing down the temperature. Tulsi is good for Coughs: Tulsi is an important constituent of many Ayurvedic cough syrups and expectorants. It helps to mobilize mucus in bronchitis and asthma thus is very beneficial for the maintainance of a very healthy respiratory passage. Chewing tulsi leaves relieves cold and flu. Tulsi- an excellent remedy for Sore Throat: Water boiled with Tulsi leaves is taken as drink in patients with sore throat. This water can also be used as a gargle. Tulsi- an excellent remedy for Respiratory Disorders: The herb is useful in the treatment of respiratory system disorder. A decoction of the leaves, with honey and ginger is an effective remedy for bronchitis, asthma, influenza, cough and cold. A decoction of the leaves, cloves and common salt also gives immediate relief within the case of influenza. Tulsi for Kidney Stone: Tulsi has an strengthening effects on the kidney. In cases of renal stone the juice of tulsi leaves and honey, if taken regularly for 6 months it will expel them through the urinary tract. Heart Disorder: Tulsi has a beneficial effect in cardiac diseases and the weakness resulting from the various cardiac disorders. It even reduces the level of blood cholesterol. Children's Ailments: Common pediatric problems like cough cold, fever, diarrhea and vomiting respond favorably to the juice of tulsi leaves. In chicken pox delay the appearance of the pustules, tulsi leaves taken with saffron will hasten them. Stress: Tulsi leaves are regarded as an adaptogen’ or anti-stress agent These are known to provide protection against stress. Even healthy persons can chew 12 leaves of Tulsi, twice a day, to prevent stress. It purifies blood and helps prevent several common ailments. Mouth Infections: The leaves are quit effective for the ulcer and infections in the mouth. A few leaves chewed will cure these conditions. Moreover the leaves are also beneficial in the maintenance of the healthy oral hygiene. Insect Bites: The herb is a prophylactic or preventive for insect stings or bites. A teaspoonful of the juice of the leaves is taken and is repeated after a few hours. Fresh juice must also be applied to the affected parts. A paste of fresh roots is also effective in case of bites of insects and leeches. Skin Disorders: Applied locally, tulsi juice is beneficial in the treatment of ringworm and other skin diseases. It is also very beneficial in skin disorders as leucoderma. Teeth Disorder: The herb is useful in teeth disorders. Its leaves, dried in the sun and powdered, can be used for brushing teeth. It can also be mixed with mustard oil to make a paste and used as toothpaste. This is very good for maintaining dental health, counteracting bad breath and for massaging the gums. It is also useful in pyorrhea and other teeth disorders. Headaches: Tulsi makes a good medicine for headache. A decoction of the leaves can be given for this disorder. 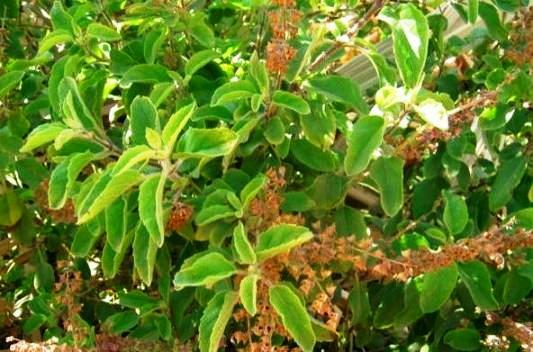 Pounded leaves mixed with sandalwood paste can also be applied on the forehead for getting relief from heat, headache, and for providing coolness in general. Eye Disorders: Tulsi juice is an effective remedy for sore eyes and night-blindness, which is generally caused by deficiency of vitamin A. Two drops of black tulsi juice are put into the eyes daily at bedtime. Thus also improve the vision.